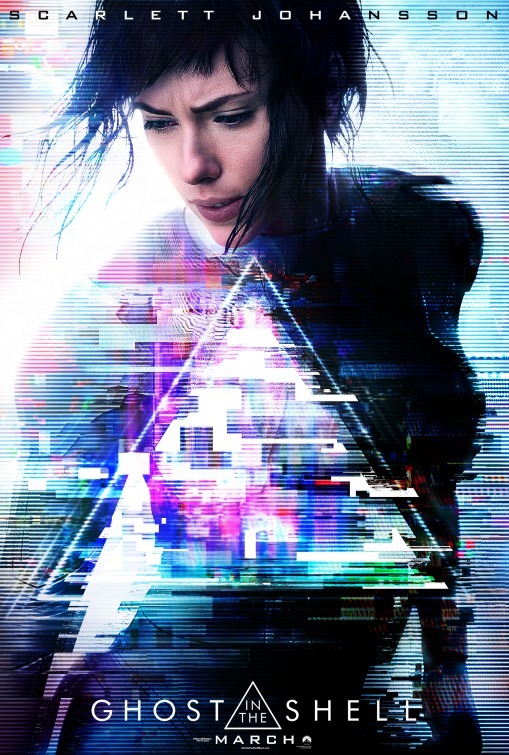 Going to the live action, western adaptation of Ghost In The Shell, had my expectations set so low, that within the first five minutes of the film, all I could be was disappointed. I was armed to the teeth with arguments about failing to live up to the original manga and the 1995 anime, when the film gave up just after the opening credits. There are many problems with this film. The whole whitewashing casting of Scarlett Johansson as Major (Motoko Kusanagi) was first and foremost during the film’s production and marketing. But we’ll get to that a bit later when we’re in spoiler territory. Also if you are sensitive to spoilers. There aren’t any really. The universe is already written, and it’s playing out like a record. On with inevitability. So in the ‘near future’ cybernetic enhancement is growing commonplace. A young woman has her brain transferred into robotic body. As she regains consciousness she is told that her family were killed in a terrorist attack on a refugee boat. Immediately afterwards, the scientist responsible bringing her back talks with the CEO of the robotics company that she represents the future of the company and basically how they lied to the newly reborn person. So these guys are the bad guys. Thanks for not wasting my time (*throws a ream of notes in the bin*). So this isn’t going to be a knock off of Blade Runner either. I’m willing to bet this gets a sequel. A bad sequel. The Hanka Robotics company give the cyborg to Department of Defence’s Section 9. And we skip a year ahead. Now this cyborg, which every other member of Section 9 refer to as ‘Major’. This in itself is odd. How did she go from amnesiac cyborg to a rather high military rank in a year? Cybernetics, I guess. Later we also learn that her name is Mira Killian (I couldn’t quite hear it over the constant explosions, every time ScarJoBot said it. I thought her name was Meryl). Anyway, Major learns that someone is hacking a hotel that happens to have a foreign president and an executive of the Hanka robotics company. Suddenly, the geisha-bots serving the party go berserk and begin hacking people. Major leaps in, in a scene lifted from the film and manga, and starts blazing away at the robots and yakuzaborgs that have joined the fray. And this is the beginning of the investigation of Major and the rest of Section 9 trying to track down ‘Kuze’ who has killed several other leading scientists from the same company. But rather than look at the projects that each of the scientists might have been involved in, you know, like detectives, they decide to beat up the yakuza instead. The violence in this film is inflicted in a strange way. Members of Section 9 are prone to shoot to kill, rather than apprehend. Since Section 9 should be an anti-cyberterrorist unit, would their main prerogative be to make as many arrests in order to break into the inner circles of such groups? Apparently not, as Major, Batou and the rest of S9 shoot armed and unarmed, wounded and prone all the same. A main cause of death is standing near, running from, or being interrogated by Section 9. Kuze’s motives are fairly clear, he is a failed experiment performed by Hanka, and one where Major was a success. He wants and actions vengeance on all those involved (What is it with vengeance plots? Can we please stop?). The chief villain of this piece, Hanka CEO Cutter (just ‘Cutter’ apparently) see Motoko and the other experiments he authorised as the future of his company, but the film is lacking in the continued production of more cyborgs or robots to show the expansion of this goal. After all, if Major is such a success, why aren’t there more RoboCops? I mean Majors. We eventually get to Major’s past, where there was no terrorist attack that killed her. Major was a runaway named Motoko Kusanagi, who was abducted by Hanka and then experimented on and turned into cyborg, along with the fellow that became Kuze (I see what you did there. Motoko was Japanese and the filmmakers robotics company transformed her into ScarJoBot. Get It?). However in the year that Major had spent with Section 9 and all of their resources for fighting crime, she did not once seek out the terrorist event that caused her apparent death. Would the Hanka (Hunka Hunka) Corporation have to blow up a boat of refugees at the same time for the cover story? Would they have to fake a boat of refugees and then blow up the fake boat instead? Is there a monument to the real or fake refugee boat disaster of a year ago? Nope, none of that stuff is important, I guess. It’s just written off. Section 9 is attacked by the security forces of Hanka. None of these security forces are cyborgs like Motoko Major, not overtly at least. Aramaki takes out four of them with a revolver, whereas Major survives her battle with spider tank. That’s what they literally call it too. Nothing fancy like tarantutank/tankrantula. Tanks a lot. No one is arrested at the end to serve justice. Cutter is shot by Aramaki, showing there is no actual justice system in the near future, just cyborgs playing cops and robbers. The Major then talks about saving peoples lives blah blah blah, she jumps off a building and fades out with thermoptic camouflage. Cut to a black screen with a sci fi – oh wait, just a regular font. Sigh. Nevermind. The film fails on many levels. More than I’ll address here. I’ll leave that to a friend to cover the remains. It even fails for me to profoundly dislike it, like Lucy or Elysium. It’s just so underwhelming and disappointing. It’s set in a “Tokyo”, but a Tokyo so full of westerners. Getting ScarJoBot as the main character served only the purpose of getting bums in seats. She’s recognisable to western audiences, not Rinko Kikuchi. It’s racism by committee. The iconic scenes lifted from the 1995 anime are repeated in CGI-rendered “live action” and are there purely for visual linking, not thematic. The 1995 film explored Motoko’s humanity in the face of being a cyborg for most of her life. This film explored how cyborgs of various grades exact violence all the same. The Ship of Theseus can be the same or a wholly new ship, but it doesn’t speak of the person who Theseus is/was. One thing I did like: Beat Takeshi Kintano did not speak a word of English. All of his scenes was like watching Johnny Mnemonic again. Apparently the concept art is great too, pity it was wasted on this film. Just read the manga or watch the ’95 anime. I mean, it’s still full of male gaze, but they work a better story. Or read Old City Blues. It’s a nice cyber police procedural set in New Athens. Here’s how the film could be improved. Major Motoko Kusangi is a member of the JSDF. Heavily wounded in combat, Motoko consented to a procedure that would make her almost a robot. From there, she would continue to serve the military. She is transferred to Public Security Section 9 to work as the new tactical officer under PSS9’s commander Aramaki. PSS9 work cases that involve cyberterrorism and cyberintelligence, where it may involve people minds being hacked or state secrets leaked through similar means. The team is currently attempting to track a hacker, which has broken into several robotics companies and attempted to either gain control of the means of producing more robots, or gain control of the executive staff of said robotics companies. It is learned through detective work and tracing the hacks that the hacker is a sophisticated Artificial Intelligence that is attempting to coalesce into a single robotic body. Several organisations and governments are scrambling to gain control of the robot as it presents a “holy grail” of technology. Motoko in the meantime, though grateful of her new life, begins to fear that she might be missing something being a cyborg, questioning her humanity in the face of an AI that mirrors her. Since the AI may indeed be made a slave of whichever organisation gains control over it, Motoko goes rogue to find a way to provide the AI actual freedom. Both are mortally wounded in the escape attempt. The AI offers to merge with Motoko and return to the Net where it can make the attempt to coalesce again. The film ends before Motoko makes her decision. This entry was posted in film and tagged film, ghost in the shell, gits, manga, masamune shirow, review, scarjobot, shirow, whitewashing. Bookmark the permalink.